I have found myself in recent years asking myself if that is still the case. Certainly folks visiting Stehekin and experiencing the community will feel like they have taken a step back in time, but are we really the quintessential mountain community of yesteryear? I guess that really depends on what time period you want to grab. My childhood in the valley was spent on the very same piece of property where Stehekin Valley Ranch is located today. My parents raised six sons in a small log cabin by the river. Luxury to my mother was the kerosene refrigerator and the gasoline powered Maytag washing machine that she could set up on the porch to do laundry. It was also a luxury that the cabin was within a hundred yards of the river because that made it easier to carry the water. Other luxuries we enjoyed were Aladdin lamps and Coleman lanterns for light. Every generation has what are considered luxuries and so it all depends how far you want to reach back to experience “the good old days”. I often quip that we in fact had running water if we ran with the buckets on the way back from the river. Today however I enjoy the running water piped in to my house. One of the things that people today have become accustomed to is public power to run all of our favorite toys and technology. The truth, however, is that this source of energy that we so often take for granted is hard to come by if you are not living on a “grid” that connects you with a large power source. In the early 60’s my dad had the chance to be tied into such a grid at no cost to him, but he declined. It was not that he was against electricity or modern conveniences so much as it was that he thought it would change the character of the community in an adverse way. It is also a question of dependency. Small systems such as the one we have in Stehekin are subsidized by others. This means that other people in Chelan County must pay part of our power bill. I am no purist – I lived on the grid before I took up full time residence at the Ranch as an adult – but to my father that was welfare and he loved the idea of being self sufficient. There was a public meeting at the time, and my dad was one of a very small minority that did not want subsidized power. After folks spent considerable time explaining why it was such a wonderful benefit that we absolutely must have he reminded them that for the price of a one way boat ticket they could have all the public power they wanted. I cannot remember if he offered to buy their ticket for them, but either way it did not win him any friends. My…that was a long winded way to tell folks that Stehekin Valley Ranch is off grid, wasn’t it? 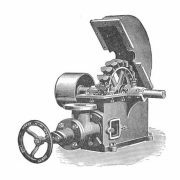 In my father’s day (and before government got in the way) the best answer for an independent power system was a micro-hydro system that could turn out enough power for lights and small loads. As you can imagine, if we didn’t have running water we didn’t have a water turbine at the old cabin either. When we moved – with the latest child in tow (finally the daughter they had been wanting after six sons) -to the new cabin further from the river, Dad did pipe in running water from the creek. My brother Tom hooked us up a small Pelton Wheel so we could have better lights and run the record player. That system Tom hooked up was tiny, so when we opened the guest ranch we had to depend upon diesel fuel for our power. Today, we are politically blocked from using micro-hydro, but solar systems are starting to be a feasible alternative for rural power. The downside is that it is quite expensive initially to set up, and cannot generate as much power. We started our new power venture in 2013, and that season solar was used for approximately 50% of our power. By 2015 we went from running our diesel generator 16 hours a day with no solar input to only running it 2 hours a day, letting the solar take care of the daytime load! This is a win-win – lower operating costs have already gone a long way to offsetting the initial expense of setting up the system, and we are also running a much “greener” facility by not burning diesel all day long. 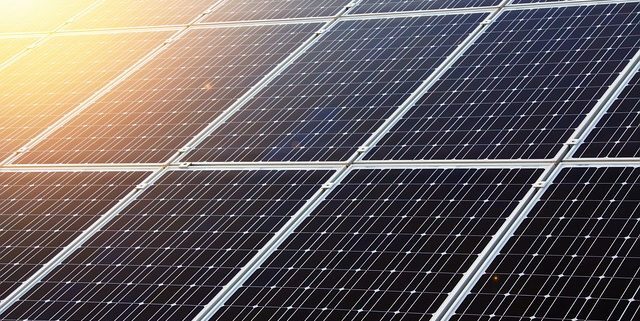 This switch from fossil fuel does come with a need for our friends and guests to adapt to how much power is available and when. Visitors to this valley care about it deeply and the need to adapt has been met with very friendly support and often with enthusiasm. We still have everything we need in the way of proper refrigeration, lights and hot water available 24/7 as well as the ability to run the kitchen dishwasher and vent fan. Mostly what folks have had to give up has been the hair dryers and curling irons. We still have ample power to power up the techno-gadgets and to run the CPAP machines when needed. So is this like yesteryear? Not exactly, but in some ways it may be better. We continue to strive to provide a genuine experience where you can feel and appreciate a small mountain community. We still desire to be self sufficient and to lead a homesteading lifestyle where most of our living is made and not earned. In the coming years you will see more animals, more organic food and more alternative solutions to provide creature comforts in an earth friendly and community building way. Come join us and share your knowledge. The real joy of this business is the people we meet. The next great innovation or idea may come from you! The short answer is that it was built by Cliff’s father, Ray Courtney. However, that answer does not even begin to scratch the surface of the rich and enchanting history of the “Trapper Cabin.” Read on for the rest of the story…. Ray Courtney grew up as the youngest of 4 children. While the older kids enjoyed smoking and listening to the radio with their father Hugh, Ray didn’t smoke, and preferred peace and quiet in the evenings to work on projects or write. The Courtneys grew up in a self-sustaining atmosphere – if they couldn’t make it themselves, they generally did without. So Ray learned at an early age to build things and live off the land. At age 15, he decided to build his own cabin. He set about falling trees and clearing land in the woods out behind their barn. He then started building a 12×20 foot log cabin with a cedar shake roof and a large porch where he could keep a supply of firewood. Ray’s cabin served him well – giving him a place to retreat to when he needed space. He sculpted Cedar slats to fill all of the voids instead of using chinking, and built in a pine desk for his writing. Complete with a wood stove for warmth and a kerosene lamp for light, it had everything he needed. In later years, the cabin started travelling – eventually ending up at its current location at Stehekin Valley Ranch. Originally, the cabin was on the Courtney Family homestead – on the opposite side of the River from the Ranch. Unfortunately, Curt Courtney, one of Ray’s older brothers, sold that piece of property where the cabin was located to the National Park Service. At that time the cabin was moved down lower on the homestead to a piece that Ray owned himself. When Cliff started the Ranch, he decided to move that piece of family history as well – ensuring that it would be remembered and maintained for folks to enjoy. The cabin was taken apart log by log and re-assembled where it stands today. The early years at Stehekin Valley Ranch. Stehekin Valley Ranch was established in 1983 by owners Cliff and Kerry Courtney. It is on the property that the Courtney family has owned since the early 1950’s. The Courtney family history goes way before that, but that is another story for another time and a great question to ask when you come stay at the Ranch! Esther and Ray Courtney bought this 20 acre piece, raised their family on it, and ran their mountain trip business (Cascade Corrals) – which is still family owned with their grandson Colter Courtneyat the reigns. (Visit the Stehekin Outfitters website for more on the current mountain trip business). When Ray passed in 1982, Cliff began to think of his future and how he would be able to stay in the Stehekin Valley which he loved. Wanting to continue the tradition of sharing this valley with others, Cliff came up with the idea of providing a full-service base-camp from which people could get out and enjoy the epic surroundings of the North Cascades. And so, Stehekin Valley Ranch was born. Genuine “camping” feel from the outdoor dinning hall. 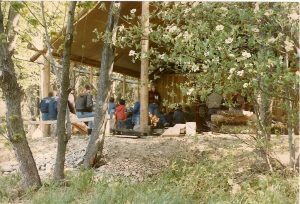 At the beginning, the Ranch was mostly a “rustic” campground consisting of Tent Cabins, outhouses, and the Dining room was all outdoors. 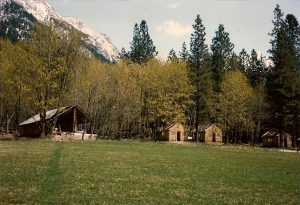 As the word spread about the good food and unique lodging, the demand to stay at Stehekin Valley Ranch grew, so then did the Ranch. The Ranch added the Ranch Cabins and enclosed the Cookhouse making the Ranch more of a “luxury” campground. Don’t worry, we made sure the keep the “rustic” too. As Stehekin Valley ranch has evolved, it has kept many important things the same as when it started. Most important among these – the food. The Ranch maintains a very high standard for food served in the Cookhouse. The many wonderful meals we taste now are all thanks to the family cooks who started it all. 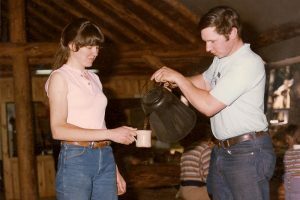 Cliff Courtney pouring a hot cup of Cowboy Coffee for his wife Kerry. Stehekin Valley Ranch has also maintained its easy going, welcoming, and “part of the family” atmosphere. When staying at the Ranch and learning about it’s history, you can’t help but feel like you are “part of the family” as you sit down family style in the Cookhouse and enjoy your meals together. We have been blessed to share the Ranch and the beautiful valley that surrounds it with so many. It is too good to keep it to ourselves! We hope you can visit and experience it yourself.